How useful is the new tabbed Gmail inbox? As you may know already, Google has added a new feature to its Gmail email service that it states will put you back in control of your inbox. The feature will roll out over the coming weeks with many Gmail users reporting that it has been already activated for their account. You can check that easily with a click on the settings icon in the top right corner on Gmail. If Configure Inbox is displayed there in the context menu, your account has been updated. A click on the link opens a small overlay screen that you use to configure the feature. You need to move the mouse cursor over items to display information about each tab that you can enable on Gmail. Anyway, up to five tabs are displayed on top of the list of emails. These tabs act as filters that sort emails based on type using algorithms. Primary - lists person to person communications, as well as starred messages by default. Social - messages from social networks, dating services, social media and other social-related sites. Promotions - includes deals, offers and most marketing emails. Updates - Personal updates including confirmations, receipts. bills and statements. Forums - Emails from mailing lists, forums and other discussion-based services. The sorting works considerable well where social is concerned, but that is to be expected as Google is probably filtering messages by domain here. The remaining tabs all include messages that should have been sorted into different tabs. The updates and forums tab included press releases for instance which does not really fit either of the groups. While it is possible to move mails around via drag and drop, it is clear that you will have to monitor all tabs regularly because of this and can't just ignore the social tab or any of the other tabs completely as you may miss out on emails. You can turn off the new tabs easily again. Click on the settings icon and select Configure Inbox from the options. Uncheck all options there so that only primary remains checked (you cannot uncheck primary). When you go back to your inbox, you notice that all tabs have been removed from it again. Google has created a video that demonstrates the new functionality of the inbox. The sorting works fine for most emails that you receive but not for all of them. This makes it less usable than it should be, as it forces you to monitor all tabs at all times to catch misfiled emails. It is also making it difficult to check all new emails as you now may have to click on different tabs to read them all. Gmail indicates new mail on the tab headers which helps somewhat, but you will still have to click up to four times more than previously. 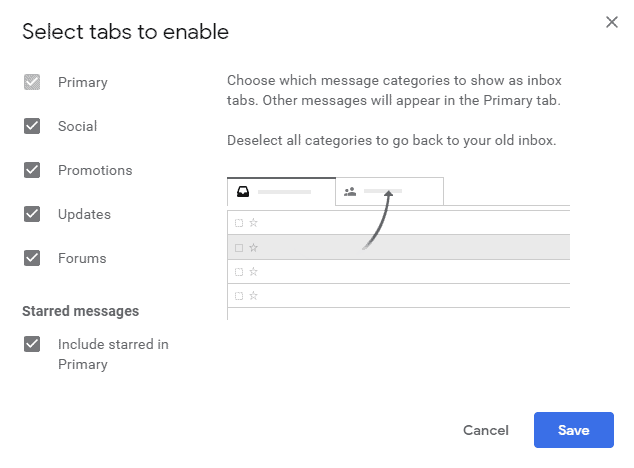 A first look at Gmail's new tabbed inbox interface, my take on the feature, and instructions on disabling the tabs so that you end up with a single listing for all emails. I already have my emails configured to come in labels which are colour coded. This is an option for retards/lazy who cannot configure/organise their inboxes. Sorry for being blunt. Totally agree, colored tabs are the way to go. Switching from outlook to gmail is a difficult one for people that just don’t “get” tags but once you have a decent ruleset in place I look at windows explorer and wish I could do that with documents and images. I have no interest in cluttering up the UI with these tabs. They are wasting their programming efforts on foolish things like this. Google has gone off the track with changes to the UI in Gmail and Google+. I am thinking of moving to Microsoft, Outlook.com for personal mail and Office 365 for business, because I no longer trust Google to keep me in mind when they change or kill services. Hey, gotta show the upper management that you’re doing something right? Maybe this has some extra useability for smartphone users…? Personally I access my gmail on laptop and have used filters, colour coding and stars, for some time, which works pretty well, and is easy to maintain, although I also keep an eye on the auto spam folder. An automatic sort sounds good in principle, but if it is prone to error, requiring more monitoring, then I’m not so keen. Social media is also a much used and grey term these days…for example, facebook is to me a personal social media, whereas I regard linkedin as a work related media. I prefer not to mix personal items with work, if this lumps both together its definitely not for me. New tabs are totally useless for Me. Alltogether crap and only confusing specially elder people. Instead tabs, I use spam filters. I don´t get and don´t need, nothing “social”, “blaa blaa”, etc. in My inbox. I know for sure, that when this new “amazing” feature comes for everyone, my phone starts ringing for help. Ditto, adding tabs is going to be like the coloured label system currently in place. It makes my inbox look like a fricken box of broken crayons mashed together. Personally I like cleaning stuff up into folders like everyone else and wished G-mail would adapt that idea as well. It’s a basic concept of all o/s to organize stuff, make a folder and stick stuff into it ~ simple and clean. Then came G-mail’s coloured label system which was suppose to make our lives simpler, but all they do really is make things complicated. If you only have a few labels then it isn’t so bad but for those of us with a dozen or more required labels, our in boxes and, ‘All Mail’, categories are littered with dozens of colours all mashed in no seemingly particular order other than the day they arrived. It sounds like you don’t use the sub label or nesting of tags they introduced. If you nest your labels like tag/subtag they appear as folders on the left menu. Each subtag can also have rules assigned, for instance I have all HP updates for my server tagged as label:tech-support-alerts. This allows my inbox to remain clean and archiving is as simple as a single click. But does it retain this tab organization in the, “All Mail”, folder as well? Otherwise it is really pointless. It’s very awkward. I have to switch between the Tabs to check the new emails. Silly. On the PC I tried, the tabs are too big on the cozy and comfortable display density. Coupled with the search bar and the button bar below it, its like IE toolbar hell. Really took away much space to view the mail itself.